Burmese Pythons are excellent swimmers and can stay submerged for up to 30 minutes before surfacing for air. Burmese Pythons are typically dark coloured snakes with their beautifully patterned skin. 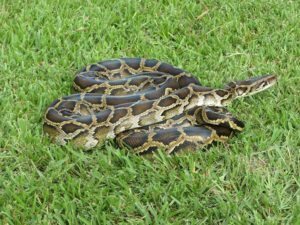 They have a rapid growth rate and generally docile disposition and may be best known as the large snake of choice among reptile owners. They can grow up to 19 feet long! The Burmese Python on display in the snake exhibit at the Hope Zoo is labelled ‘Blondie 2’ and is actually an Albino Burmese Python. This means that it was born with generic variation making her yellow rather than the dark reds and browns that most of these species exhibit. Albino animals are not common in the wild because as juveniles they are easily spotted by predators.